How do I buy a Boulder Designs Franchise? Manage and run your own custom boulder business using a simple business model designed to allow franchisees to work from home or an office space. Flexibility and scalability are key to your business operations. You can own an individual unit or multiple units. Boulder Designs offers incentives for multiple franchises; $5,000 off the initial investment fee and 25% off the royalty fee for the life of the franchise. A Ground Floor Opportunity with Little to No Competition. 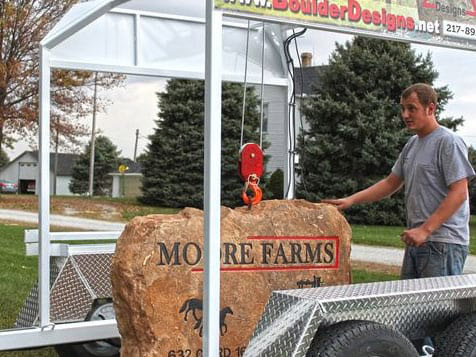 How many businesses do you know of that make customized or personalized boulders? Probably not too many. That’s why Boulder Designs is attracting entrepreneurs to our franchise family. There’s not much competition if any. Further, we are growing at a rapid pace with plenty of prime territories available. That gives you a ground floor opportunity to be a part of a business that has little to no competition. In 2017, Boulder Designs ranked #322 in Entrepreneur’s Franchise 500 list and #4 in Military Times Best for Vets Franchise list. Learn more about this unique and creative franchise today. Open Boulder Designs in any of these available states: AK, AL, AR, AZ, CA, CO, CT, DC, DE, FL, GA, IA, ID, IL, IN, KS, KY, LA, MA, MD, ME, MI, MN, MO, MS, MT, NC, ND, NE, NH, NJ, NM, NV, NY, OH, OK, OR, PA, RI, SC, SD, TN, TX, UT, VA, VT, WA, WI, WV, WY. Owning a Boulder Designs franchise gives you unlimited creativity when working with your customers. 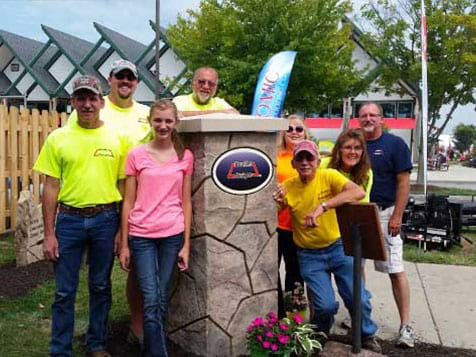 Our franchisees report they draw great reward and satisfaction being able to work with their customers to design and create a custom boulder into just about anything; fire pit, mailbox, bench, house marker, monument. Imagine all the business owners and residents in your area who could use Boulder Designs products for exterior signage or to enhance landscapes. 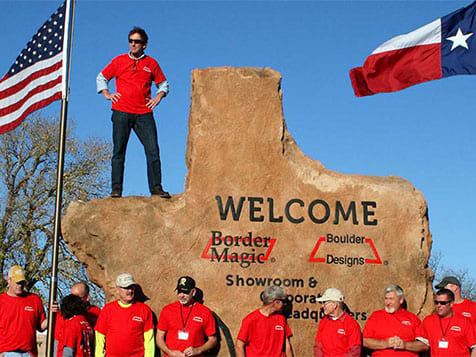 Boulder Designs has a diverse product lineup that attracts attention and can turn any business into a landmark. Boulder Designs is a simple franchise system with low cost of entry and minimal inventory requirements and, it's fun! 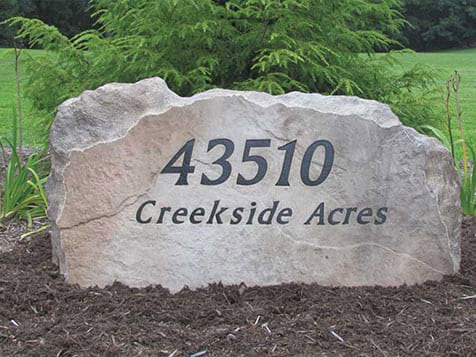 Boulder Designs trains you how to create custom boulders that can be used for name or address rocks, memorials, business signage, ranches, schools, parks, subdivisions; anywhere that signage is desired or needed. Our earth-friendly products are often allowed by local zoning regulations where other signage is not. Boulder Designs is committed to well rounded, specific training for our franchisees. 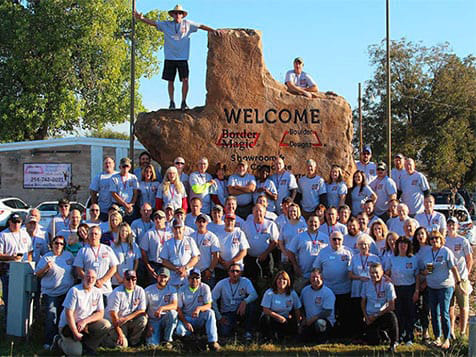 The initial training program consists of spending a week at our corporate headquarters in Waco, Texas. While at our corporate headquarters, we will identify and work with your strengths to get you ready to run your business as soon as training is completed. Building a boulder is quite frankly a fascinating process. Our “Boulderology Bootcamp” gets you trained and ready to build your product and thereby your business. One day during the week of initial training at our headquarters is dedicated to teaching you how to use Boulder Designs equipment and understanding the proprietary additives process to create a strong, viable boulder. Our franchise administration personnel is a key component to your Boulder Designs operation. We have ongoing administration guidance to support your franchise. This includes items such as assisting with annual marketing reports, recording and compiling customer satisfaction surveys, and office requirements (marketing, advertising, bookkeeping, etc.) to name a few. The corporate office also assists you with your operations which are critical to maximizing success for our Border Designs owners. From lead distribution, newsletters, to recording and retaining all leads and communication with your customers, Boulder Designs is committed to helping our business owners succeed. Boulder Designs is proud of the men and women who have served in our armed forces. We are pleased to offer incentives to our veteran franchisees. Veterans receive $2,500 off the initial investment fee and 25% off monthly royalty fees for the first five years of their operation. Inquire about joining this one-of-a-kind Designs franchise today. Boulder Designs is not currently active in our directory, but here are some other recommended selections for you to explore.